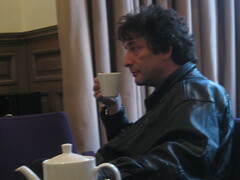 Neil Gaiman is an easier man to reach than many of the people who work for him. That is sometimes the case with the really big and famous. 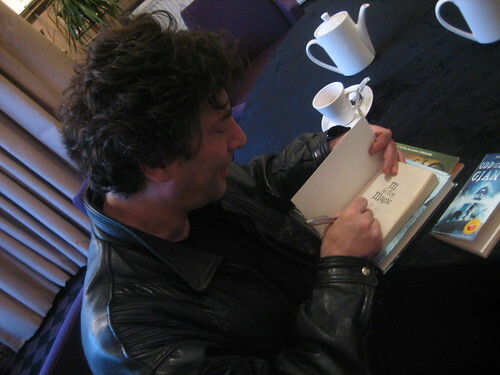 So I persevere with my attempts to get to talk to Neil when he comes to Edinburgh, in spite of not having understood until recently, quite how big Neil Gaiman is. But at least I’m not alone in this. Vanessa, of Fidra Books which is hosting his event this evening, was also quite clueless when she first contacted him. Encouraged by Glasgow author Julie Bertagna, who is a big fan, I lean on Ian Lamb from Bloomsbury for so long, that the poor man gives in and allows the bookwitch a generous time slot with Neil at his Edinburgh hotel. Julie comes along, as I firmly believe there can never be too many authors at once. The hotel has bookwitch coloured chairs in its grand meeting room, and they serve some very welcome tea. Julie and Neil discuss book signings and Neil mentions his first one for children, which he’d found terrifying. Julie says she does mostly teenagers, and she reckons adults will be well behaved even if they’re not interested. “Yes”, says Neil, “kids will talk quietly amongst themselves, or not quietly.” “Or open a packet of crisps”, agrees Julie. Neil – “No, it all started with two journalists who were talking amongst themselves about favourite childhood books, and they got on to the subject of Victoria Walker’s books, and they emailed me, because I’d mentioned the books online. They asked ‘did you ever read The Winter of Enchantment?’ and I said ‘yes, it was a favourite’ and he said ‘whatever happened to it?’ And so I mused publicly on my blog on whatever happened to Victoria Walker? You have this children’s writer who is loved and remembered, and her books that were going for up to £900 online, and nobody knew what had happened to her. Neil – “Oh, you’ve missed this nice Norse stuff in there. 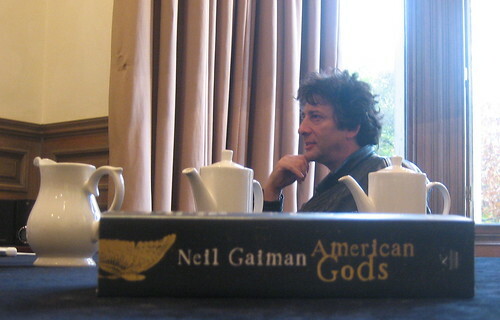 I think American Gods is a novel that actually makes a lot more sense than – who wants tea? – I think it’s probably one that makes a lot more sense to people who know the Norse Gods, because you definitely need to understand that they are not your friends. (Laughs.) It’s a weird concept I think, for some people to get, because they get very used to the idea that Gods are people-like parents who love you and adore you. The Norse Gods never were that. Even Thor is mostly pictured as being, he’s not very bright, he’s not the smartest one in the block, you know. Odin is somebody you really … given the choice of having him come to your house or not come to your house, you don’t want him in your house. And it’s all gonna end in tears, (Pours tea.) all heading towards Ragnarök. And by the way, everyone’s gonna die. The funny thing about the Norse Gods for me is that it’s something I keep thinking I’ve got out of my system. I loved doing them in Sandman, and then they seemed so right for American Gods. I don’t always remember (where I get my ideas from), but I do with American Gods. I had bits of it knocking around inside my head, but I didn’t know what it was. Then I was in Iceland and it was one of these things when the plane was gonna give me a thirty hour stopover in Iceland, and I landed at six o’clock in the morning and had not slept on the flight, and I thought ‘well, I’ll just keep going until it gets dark’, which would have been a really sensible thing to think had it not been July 3rd, which meant that at four am I was lying there in a hotel room with curtains that didn’t seem to be doing anything to keep the light out, wishing that I hadn’t left the little eye things that they gave me on the plane, on the plane. Neil – “It’s odd, because it’s a bit The Jungle Book, and then PL Travers kept creeping in on the edges. I basically took the initial idea of The Jungle Book and of course you have the dead child and the family and the child wanders out and is threatened by the menace of the wolves, and Bagheera comes in and says ‘I will be his guardian’ and you’re there. In the case of The Graveyard Book it pretty much matches that beat for beat, with a gentleman called Silas standing in for Bagheera, and after that I didn’t really plan to go back and do anymore, but then I thought you’ve got that wonderful chapter with the monkeys, and I had this idea of these little ghouls; I’ll do a little story with them, and I’ll do something inspired shapewise by the ghouls. When PL Travers did the Mary Poppins book she would do a story with a title like Bad Tuesday, where one of the kids would have a really bad day, and they would run off and they would be walking into a mirror or they would go into a plate or something like that, and they would have to be rescued by Mary Poppins, who’d be off on her day off anyway, and come back. The other great thing with wanting to do what PL Travers did, were these odd little stories where everybody would go down to the park and there would be a sort of magical eruption that Mary Poppins had created, and the world of normality would interchange, and you’d become someone just for the space of a chapter, or an hour and then it would be over, and everybody would be floating through the park on balloons or whatever. Neil – “Puzzled, actually. Mostly. Because I think you could line up a thousand Hitchhikers’ Guide fans and ask how many of them would like to read the Further Adventures of Arthur Dent and Ford Prefect and Zaphod Beeblebrox, and they’d give you a funny look. Nobody ever came to that story for the plot. Nobody ever came to it for the characters. You never liked the characters. Douglas made no pretence they were meant to be anything other than paper thin. We came for the sentences, and you came for the idea, and most of all you came for the world view. Eoin is very smart, and I like him a lot and I’m sure he will write his Hitchhikers book with a great deal more enthusiasm and enjoyment, and finish them much much more quickly, than Douglas ever would have done. But I don’t see the point; on a deep fundamental sort of level I don’t see the point. Nobody is waiting for them. It’s not like Douglas finished mid cliff hanger and everyone going ‘oh my God, what is going to happen to Marvin?’ because nobody cares what’s going to happen to Marvin. What we want is another good Marvin gag. We like Marvin to come on and be depressed, but you’d like it in the context of a wonderful Douglas Adams sentence . Exactly the same way I would feel just as baffled if someone announced that Eoin Colfer was going to be writing more Emsworth and Jeeves books for the P G Wodehouse estate. Nobody is going ‘I need more stories about Jeeves and Wooster’. What they’re going is ‘do we miss P G Wodehouse? Would we like more brilliantly turned and more brilliantly convoluted plots?’ Of course we would, but I don’t want Eoin to write them any more than I want Stephen Fry to write them or anybody else. What I’d like is more P G Wodehouse, but if I can’t have that I don’t want more Jeeves and Wooster. Neil – “The kind of fiction that you see a lot on the American Disney channel, sort of Winnie the Pooh cartoons, and things like that, all made for Disney, in which there’s no plot. The nearest you’re allowed to get to a plot is Piglet thinks that everybody has forgotten Piglet’s birthday, but actually they are planning a surprise party. Everything’s all right and there was never anything to worry about. Whatever you were worrying about wasn’t worth worrying about and I don’t know what anybody’s gonna learn from that. If you’re gonna teach kids, I don’t believe that children’s fiction is without purpose. 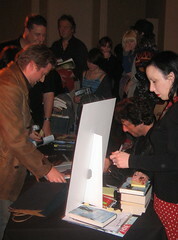 Neil starts signing the books we’ve brought with us. Julie says that her daughter will kill her if her copy of Coraline doesn’t get signed. And she points out that if Neil notices us later that evening, we are not actually stalking him, as we’ve been invited to the event where he’s talking. Neil – “Good, because he’s meant to do the punch line on that.” Goes on to comment on the iPod recorder; “very smart”. Neil – “The embarrassing thing about that was of course; I just thought it was a funny story. The way that it happened was I click on an advert for the new G1, and I click on an ad that says T-Mobile phones. I go, right, I’m interested, I’d like to touch one, and I should be writing right now, so driving down to my T-Mobile dealer is a perfect displacement activity. It’s time for us to vacate our purple chairs, as Ian from Bloomsbury comes to chase us out, in the nicest possible way. I feel sorry for Neil having to chat at length, over and over again, but he does it so well. I hope that he will get his offer of 45 minutes, but I suspect he won’t. A few hours later when we see him again at the Church Hill Theatre, he looks as good as new, and he sounds it, too. After a rapturous reception from his fans, Neil reads the Dance Macabre chapter, which goes down really well. At a guess, many of the fans have yet to read The Graveyard Book, as it’s just been published, so the reading feels fresh to most of the audience. In the questions and answers session afterwards I was sorry that we didn’t get to hear Vanessa’s son’s question of whether Neil likes Lego. I’d have loved to find that out. But Neil reassures his fans that he doesn’t feel that JK Rowling stole Harry Potter from him. Neil also says that he doesn’t really make any difference between adult and children’s fiction. To him it’s just fiction. He just wants to write. Neil tells of when he wrote Coraline for his children, and he read it to his daughter, who loved it. Then he sent it to his agent, who thought it was too scary for children. Neil suggested she should read it to her children, who also loved it. It appears we get more scared as we get older. And I forget why, but Neil told the audience that Ibsen is very boring. Not enough Norse Gods, perhaps. Great interview and I’ll have to talk to you about the ipod recorder thing. Yes, a marvellous interview. Thanks to Bookwitch, Julie, Ian and of course Neil himself. I must get up to speed with American Gods. Yes, well, two people will always have different memories of the same thing, Vanessa. On not knowing who someone is. My partner was once trying to contact a man who had made a short documentary immediately after the war about the squatters movement. The man’s name was distinctive and so Pete reached him via the London phonebook and explained in words of one syllable how, if the man had a print of the film, it would be good if it could be transferred to video as it was of historic importance. The very nice old man agreed to do this via the Imperial War Museum and was generally very chatty and helpful. Some months later I was reading a book about film and realised the nice old man had infact won a couple of Oscars for cinematography. I think he knew how to translate film to video! Lovely interview. I remember a time when the ‘Wolves in the Walls’ was a constant read in this house. Must try some of the stuff for older children and adults. So much better than an interview! Like Achuka said: What a great conversation. 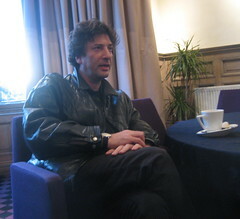 Neil Gaiman is so funny and nice. Yes. I’m not the chattiest of people, so I enjoy someone who talks without too much prompting. I wouldn’t worry about being respectable… what with cheating on your wife, lying about divorcing her, donating big bucks to Scientology and having a public midlife crisis with Amanda Palmer…. it’s pretty safe to say that you come off as less than respectable. Oh dear, out of curiosity I had a look at the comments, and though I can be quite frank online, I bear no relationship to the above Lee2! I really have no interest in the personal lives of writers – in fact, it’s stuff like this which reinforces my view of ‘text only’. I have to admit to having renamed the original commentator with a 2 added, in order to keep your good name and reputation unblemished, Lee. Thanks, BW. Seeing the ‘Lee’ had me gulping a bit. I have plenty of blemishes, but at least they’re my own! No worries. You’re not respectable, Neil Gaiman, you’re a Scientology idiot and a liar. 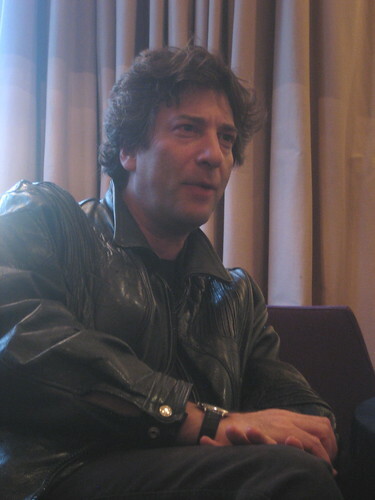 Neil Gaiman, along with his ex-wife are currently listed in Scientology’s cornerstone Newsletter (circa November 2009) under the list of contributors who gave $35,000.00 in 2009. Scientology newsletters only list members in good standing. Those who have left the Church or been declared Suppressive, which would be Neil Gaiman’s status if he had left, would never be listed. Neil Gaiman just gave another half a million dollars to Scientology. Alan. Because Scientology is a cult that destroys people’s live, uses child labor, RPF camps and disconnection to separate families. We could throw similar mud at any religious beliefs. What has it to do with his work as a writer? Well lets see… he denies being a scientologist and yet gives them money. He writes childrens books, yet funds a cult that uses child labor. 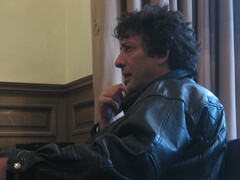 Neil Gaiman funding Scientology has everything to do with whether I feel he is a suitable author to read to my children. Well – we disagree then. Still – keeps life interesting. All one big happy family, Rowling’s publisher Bloomsbury, Fidra, the newly discovered Gaiman and all in Edinburgh too of all places where Rowling has pitched her tent! Did he drop in and say “hello” or are we not supposed to know? 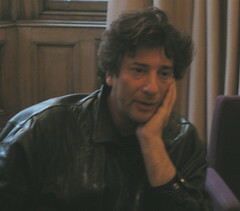 Gaiman needn’t have to worry about being respectable. How much did Rowling pay him to shut up? The comment of ten million and a castle in France that prevailed on the net for some time has mysteriously disappeared. You really do have to wonder where they all get their ideas from and how much of what they tell us is pure self-serving fiction for the deluded fantasy market. Making dough is what literature and culture are all about. We’ll no have to deny that nooooo! Is Edinburgh the only city around where these people can feel to congregate?